Cloud telephony is a type of service through which voice and data services can be operated using an Internet connection instead of a traditional phone line. Cloud telephony services offer improved scalability to companies as they enable them to add more channels over their existing trunks. They work on VoIP phone systems (Voice over Internet Protocol) and Public Switched Telephone Networks (PSTNs). Cloud telephony services can work without a physical connection to a phone company as they operate virtually. The global cloud telephony services market is primarily driven by migration of telecom companies from traditional to IP networks. This migration is due to higher return on investment (ROI) and control capabilities of cloud telephony services. In addition, cloud telephony services have evolved as a cost-effective alternative to traditional telephony systems including PSTN and ISDN. The cost of installing multiple lines for traditional telephone and Internet services is reduced because voice and data are transferred over a single Internet line. Furthermore, increasing competition in the cloud telephony services market has influenced vendors to offer competitive pricing and additional features with their services to attract customers. Also, cloud telephony services offer greater scalability to business organizations to add further channels over their existing trunks. It also offers flexibility to customers by providing localized contact numbers irrespective of their geographical location. This enables organizations to create their virtual presence in different regions. Furthermore, it enables organizations to add new users over the existing infrastructure. However, interoperability and security concerns are some of the major issues faced by cloud telephony services. Interoperability problems between vendors providing edge devices, service providers, and IP-PBX might pose challenges for the smooth functionality of SIP trunk calls, which is a part of cloud telephony services. Data breach is an important consideration for organizations due to the increasing number of cyberattacks in recent years. As voice data is transmitted over Internet lines, cloud telephony services encounter security threats and are vulnerable to cyberattacks. The cloud telephony services market can be segmented based on deployment, enterprise, network, application, end-use industry, and region. In terms of deployment, the market can be classified into cloud and hosted services. Based on network, the market can be categorized into Public Switched Telephone Networks (PSTNs) and Voice over Internet Protocol (VoIP). In terms of enterprise, the market can be divided into small & medium enterprises (SME’s) and large enterprises. Based on application, the market can be classified into conferencing, multi-level IVR, sales & marketing, customer relationship management (CRM), and others. In terms of end-user industry, the market can be segmented into telecom & IT, BFSI, government, health care, media & entertainment, education, retail, and others. The report covers the analysis of these segments across North America, Europe, Asia Pacific, Middle East & Africa, and South America, along with the qualitative analysis for market estimates supplementing the expansion of the cloud telephony services market during the forecast period. North America was a dominant region of the cloud telephony services market in 2017. The region accounted for more than half of the global market revenue share, and it is expected to continue its leading position throughout the forecast period. This is due to the presence of tech-savvy gadget users and rise in demand for advanced communication services. Asia Pacific is anticipated to be a lucrative region of the cloud telephony services market due to transition of large enterprises toward cloud telephony services solutions. Moreover, the introduction of low- cost mobile phones and tablets is projected to increase the demand for cloud telephony services in this region. However, different regulatory compliances and limited availability of efficient Internet connectivity infrastructure are anticipated to hamper the cloud telephony services market in Asia Pacific. Europe is expected to be a rapidly expanding region of the market for cloud telephony services during the forecast period. Key players profiled in the cloud telephony services market include 8x8, Inc., AVOXI, BroadSoft, Cisco Systems, Inc., DIALPAD, Exotel Techcom Pvt. Ltd., Go 2 Market India Pvt. Ltd., Knowlarity Communications Pvt Ltd., LeadNXT, Megapath, Microsoft Corporation, Mitel Networks Corporation, Natterbox Ltd., NetFortis, Nextiva, NFON AG, NovaCloud Pty Ltd., NTT Communications, PortaOne, Inc., Redcentric plc., RingCentral, Inc., Singtel, Solutions Infini., Telviva, Tripudio Ltd., VoIPStudio, Vonage Intermedia.net, Inc., and Vox Telecom. The cloud telephony services market report provides analysis for the period 2018–2026, wherein the period from 2018 to 2026 is the forecast period and 2017 is the base year. The report covers all the major trends and technologies playing an influential role in the market’s expansion over the forecast period. It also highlights the drivers, restraints, and opportunities for the analysis of market expansion during the said period. 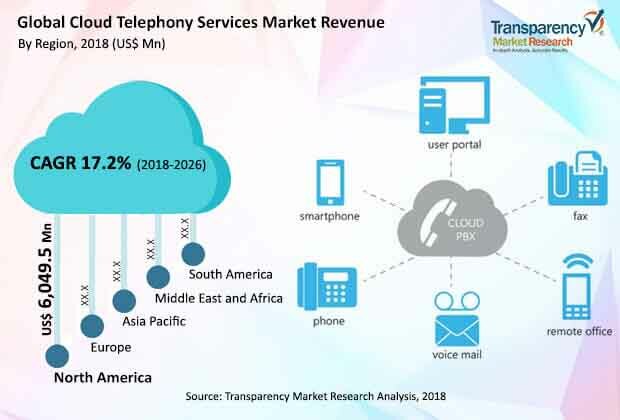 The study provides a complete perspective on the global cloud telephony services market’s evolution throughout the above mentioned forecast period in terms of revenue (US$ Mn). The market overview section of the report demonstrates market dynamics such as drivers, restraints, and opportunities that influence the current nature and future status of this market; key indicators; integration challenges; end-user adoption analysis; and key trends of market. Further, key market indicators included in the report provide significance of the factors that are capable of changing the market scenario. These indicators are expected to define the market position during the forecast period and provide an overview about the global cloud telephony services market. A market attractiveness analysis has also been provided for every segment in the report in order to offer a thorough understanding of the overall scenario in the cloud telephony services market. The report also provides an overview of various strategies adopted by key players present in the market. The report segments the cloud telephony services into deployment, enterprise size, network, application, end-use industry, and region. In terms of deployment, the market can be segmented into cloud and hosted services. Based on network, the market can be categorized into Public Switched Telephone Networks (PSTNs) and Voice over Internet Protocol (VoIP). In terms of enterprise, the market can be classified into small & medium enterprises (SMEs) and large enterprises. Based on application, the market can be divided into conferencing, multi-level IVR, sales & marketing, customer relationship management (CRM), and others. In terms of end-use industry, the market can be segmented into telecom & IT, BFSI, government, health care, media & entertainment, education, retail, and others. The report covers the analysis of these segments across North America, Europe, Asia Pacific, Middle East & Africa, and Latin America, along with qualitative analysis for market estimates supplementing the expansion of cloud telephony services market during the forecast period. The report also highlights the competitive landscape of the global cloud telephony services market, positioning all the major players according to their presence in different regions of the world, and recent key developments initiated by them in the cloud telephony services market. The comprehensive cloud telephony services market estimates are the result of our in-depth secondary research, primary interviews, and in-house expert panel reviews. These market estimates have been analyzed by taking into account the impact of different political, social, economic, and technological factors along with the current market dynamics affecting cloud telephony services market expansion. This report provides all the essential information required to understand the key developments in the cloud telephony services market and expansion trends of each segment and region. It also includes companies’ strategies, financial information, SWOT analysis, and developments under the company profile section. Also, the report provides insights related to trends and their impact on the market. Furthermore, Porter’s Five Forces Analysis explains the five forces namely buyers’ bargaining power, suppliers’ bargaining power, threat of new entrants, threat of substitutes, and degree of competition in the cloud telephony services market. This report also provides a comprehensive ecosystem analysis for the cloud telephony services market. It explains the various participants, including software & third-party vendors, system integrators, and distribution channels within the value chain operating in the market. Primary research involves telephonic interviews, e-mail interactions, and face-to-face interviews for detailed and unbiased reviews on the cloud telephony services market, across geographies. Primary interviews are usually conducted on an ongoing basis with industry experts and participants in order to get the latest market insights and validate the existing data and analysis. Primary interviews offer firsthand information on important factors such as market trends, market size, competitive landscape, growth trends, and outlook, etc.. These factors help to validate and strengthen secondary research findings and also help to develop the analysis team’s expertise and market understanding. Moreover, the data collected and analyzed from secondary and primary research, is again discussed and examined by our expert panel. The research study includes profiles of leading companies operating in the global cloud telephony services market. Key players profiled in the cloud telephony services market include 8x8, Inc., AVOXI, BroadSoft, Cisco Systems, Inc., DIALPAD, Exotel Techcom Pvt. Ltd., Go 2 Market India Pvt. Ltd., Knowlarity Communications Pvt Ltd., LeadNXT, Megapath, Microsoft Corporation, Mitel Networks Corporation, Natterbox Ltd., NetFortis, Nextiva, NFON AG, NovaCloud Pty Ltd., NTT Communications, PortaOne, Inc., Redcentric plc., RingCentral, Inc., Singtel, Solutions Infini., Telviva, Tripudio Ltd., VoIPStudio, Vonage Intermedia.net, Inc., and Vox Telecom.